It makes sense that education is a fiercely contested space. It is a collective space to which people place their most personal object (their child--since in the US, you are responsible and have legal rights over that child). So that makes for a really interesting tension. Throw into that mix, a long history of depriving marginalized folks from education (though making them pay for taxes to educate white folks), generations of redlining, denial to access many of the elite colleges, and various other systematic feature (mass incarceration--but we’ll get to that later), and you’ve got an education system that is hostile to marginal groups that it is a sign of resilience when they are able to make it through K-12, despite the systematic forces stacked against them. So, what’s my definitive recommendation for this section? 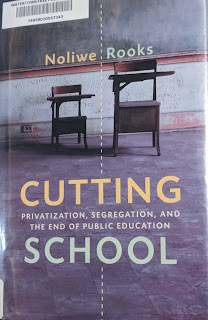 Without a doubt or hesitation, you all need to read: Cutting School: Privatization, Segregation, and the End of Public Education by Noliwe M Rooks. Rooks breaks down the historical backdrop to “school choice” and how it relates to and continues to contribute to segregation, corruption, and massive draining of public resources for private industries that often claim they are here to fix schools (typically, urban or schools that cater to minority-majority populated schools) and have at best, a dubious track record of success. It’s a powerful treatise on education that will open eyes about the depths of inequality permeating within and around our education system. Thank you for your recommendations you have posted here.